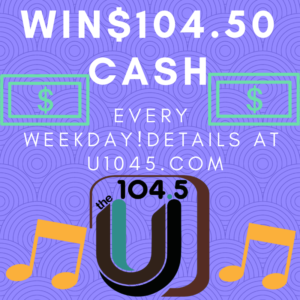 Spring is officially here, and 104.5 the U is celebrating with a daily cash giveaway! Yep, you heard that right – YOU have a chance to win $104.50 in cash EVERY SINGLE WEEKDAY throughout the entire month of April! No gimmicks or fake $10,000 prize that no one actually wins, no playing against people all over the country. Seriously, $104.50 in cash every weekday, heads out the door to local listeners just like you! Download and print out a copy of the attached Park Side Credit Union “Song of the Day” calendar. Post it somewhere handy-dandy, like your home or office refrigerator. Perhaps print out one for your car as well. 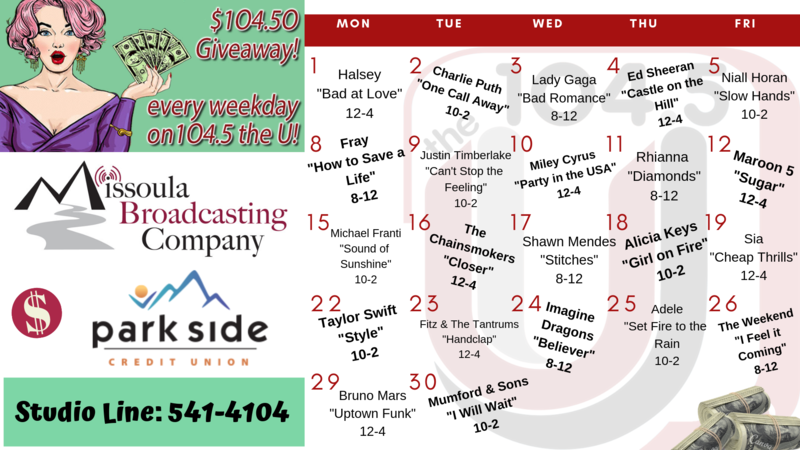 Check it out every day to see what song you’re listening for that day, and then tune in to 104.5 the U. When you hear the song, call our studio line at 541-4104 – tenth caller wins! The best part about the contest? Well, that’s the cash, of course. But the second-best part? You’ve got so many opportunities to win, you’re pretty much guaranteed to make money if you stay on top of your game! Again, that number is 406-541-4104. Good luck! And thanks again to Park Side Credit Union for sponsoring yet another great U Cash Calendar! Our favorite morning crew Brooke & Jubal will also be clueing you in on what song and when to listen in to win around 8am every weekday too! For a full description of contest rules, click HERE. Click your cash calendar below, print it out and keep it handy for your chance to win $104.50 cash money!